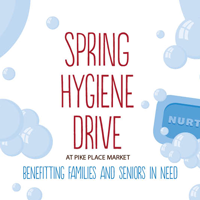 One of our favorite annual traditions in Pike Place Market is to honor Market Moms and Dads who influence and inspire our community. For Mother’s Day this year we spoke with Lina Constantino-Fronda and Kathi Allen, who are both business owners in the Market and who have been responsible for keeping our community healthy and strong for decades. You may have even purchased produce from Lina or handmade art from Kathi! Read more about these two Pike Place Market Moms and see how their kids are honoring these women for Mother’s Day this year with the ultimate gift for Mom: Pike Place Market Charms. Photos by Lance Wagner Photography. You may recognize Lina in front of her produce stand in Pike Place Market, now known as Lina’s Fruit & Produce, which she has worked at since 1963! “My mom is 74 years-old, and she still comes to the Market every day, seven days a week,” says Lina’s son, Donnie. This Mother’s Day, Donnie is honoring his mother by donating to the Pike Up! campaign and giving her a Market Charm. 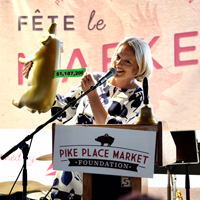 Funds from the Charm will help complete the new Pike Place MarketFront and create more opportunities for family farmers like Lina and Donnie. Kathi at her art stall, Silken Path, in Pike Place Market. Kathi and Jeff hand-make decorative art tiles using religious symbols and images under their business, Silken Path. The tiles are inspired by Christian, Judaic, Buddhist, Islamic, and Hindu traditions. 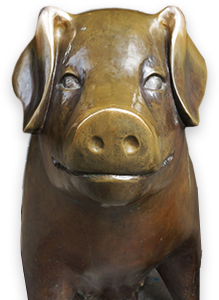 Kathi is proud that her daughter Mia owns her own business as an artist, and she also works in Pike Place Market. 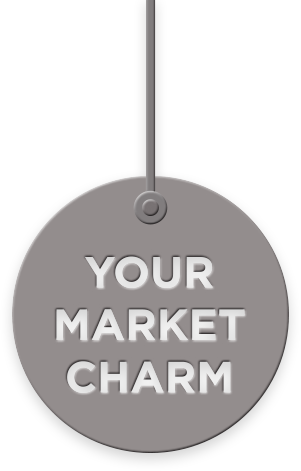 Celebrate Mother’s Day by treating the Moms in your life to their very own Market Charm.